UPDATED: Sat., March 17, 2012, 8:19 p.m. The strokes of the familiar mixed with the hues of the unfamiliar painted a canvas that promised to be anything but bland. From the moment the No. 6 Rutgers and No. 11 Gonzaga women tipped off on Saturday, it was clear that a colorful showdown was on deck. That part, however, was predictable when the matchup was first announced. What wasn’t nearly as knowable was how the Bulldogs would match up physically with Hall of Fame coach C. Vivian Stringer’s Scarlet Knights. 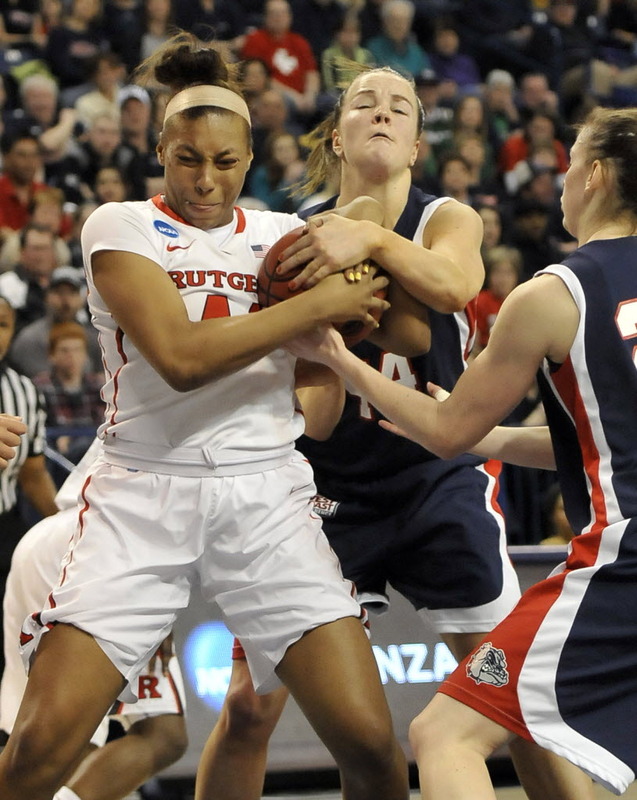 The physical factor turned out to be a wash for the Bulldogs as Gonzaga showed it’s not a soft team by plastering Rutgers in an 86-73 win in front of a sold-out crowd of 5,680 at the McCarthey Athletic Center in the opening round of the women’s NCAA tournament. “I don’t know if we out-toughed them, but I thought we stood up to them – no question about it,” Gonzaga coach Kelly Graves said. “That’s their game. They’re physical. They’re tough. … We knew we had to play that way, and it’s in us. The win marked the fourth straight year the Zags – who were also a No. 11 seed last year and hosted the first two rounds of the tournament – have advanced to the second round. The Bulldogs (27-5) will have one more game in front of their tenacious home crowd on Monday against No. 3 Miami – which beat No. 14 Idaho State 70-41 in the second game – at 6:30 p.m with a trip to the Sweet Sixteen in Kington, R.I., on the line. It certainly wasn’t Gonzaga’s biggest advantage, as the only thing more impressive than the atmosphere was the Bulldogs’ display on the court. Senior Kayla Standish scored a team-high 23 points and pulled down seven rebounds. Sophomore Haiden Palmer added 21 points and five steals in her NCAA tournament debut. Senior Kelly Bowen picked up a double-double with 13 points – including two key 3s – and 10 rebounds, and junior point guard Taelor Karr finished with 14 points, five rebounds (all defensive), two assists and three steals. Gonzaga was tough from the get-go, taking a 20-4 lead in the first 10 minutes on a 14-0 scoring run, and reaching their largest lead of the game (34-15) with 3 minutes, 43 seconds remaining in the first half. The Scarlet Knights (22-10) had a tough time putting up points in the first half, shooting 29 percent from the floor (9 of 31). The Scarlet Knights were much better in the second half, but couldn’t get any closer than 10 points to Gonzaga – which they were able to do courtesy of four NBA-range 3-pointers from Erica Wheeler, who finished with a game-high 28 points. The Bulldogs hit 14 of 16 free throws in the final 3 minutes of the game as Rutgers got desperate and began fouling to stop the clock. “They did what they do,” Stringer said. “I thought our defense would be more destructive … we seemed to be just a half-step – I’m not sure why – but maybe a half-step short. But we worked hard. An atmosphere only trumped by that old, familiar feeling of victory for Gonzaga. Percentages: FG .413, FT .583. 3-Point Goals: 7-21, .333 (Wheeler 6-14, Sykes 1-7). Team Rebounds: 1. Blocked Shots: 2 (Canty, Oliver). Turnovers: 19 (Rushdan 6, Oliver 4, Sykes 3, Wheeler 3, Laney, Canty, Speed). Steals: 8 (Rushdan 3, Wheeler 2, Speed 2, Sykes). Percentages: FG .426, FT .758. 3-Point Goals: 9-19, .474 (Karr 3-6, Palmer 3-10, Bowen 2-2, J. Redmon 1-1). Team Rebounds: 7. Blocked Shots: 2 (Standish 2). Turnovers: 19 (K. Redmon 5, Standish 4, J. Redmon 3, Karr 2, Palmer 2, Bowen, Greinacher). Steals: 12 (Palmer 5, J. Redmon 3, Karr 3, Bowen). Published: March 17, 2012, 3:25 p.m. Updated: March 17, 2012, 8:19 p.m.